A licensed attorney, Laura Avila works for us as our senior paralegal assistant and Mr. Markham’s executive assistant. 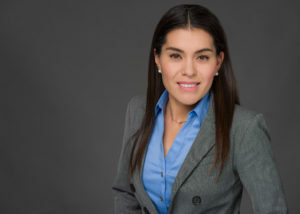 She holds a law degree from a very good law school in Mexico (Universidad Autonoma de Baja California) and has worked with Mr. Markham since 2006. She helps us to obtain, organize, analyze, and present evidence for use at trial, organizes our case files, and collaborates with our IT specialists to ensure that all of our information is properly stored, archived, and instantly accessible to each person in our firm. Ms. Avila plays a key role in our fundamental work and regularly collaborates directly with Mr. Markham in order to help him improve his presentation of evidence and arguments. You can reach her directly at la@markhamlawfirm.com.